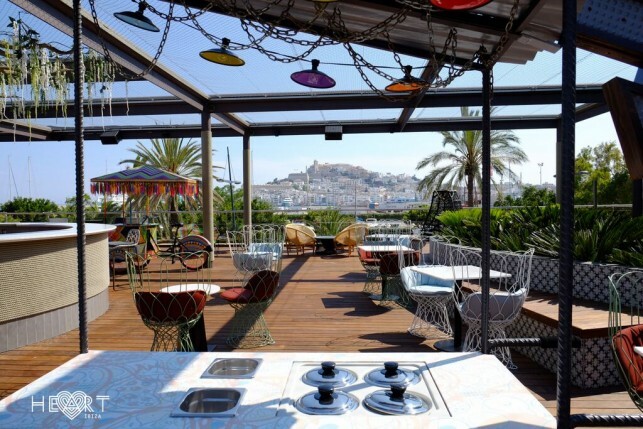 The latest gastronomic arrival on the iconic island of Ibiza is HEART. This concept is the result of a collaboration between Ferran and Albert Adrià, better known as the El Bulli brothers, and Cirque du Soleil. 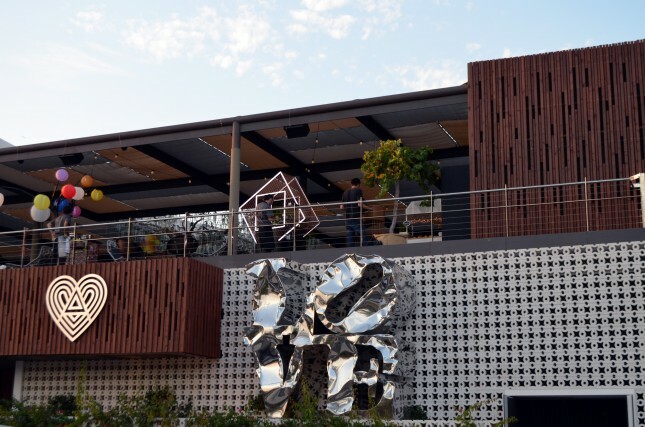 Ferran and Albert opened several restaurants in Barcelona the past few years, ​​including the already iconic, circus-like Tickets, and the Nikkei restaurant Pakta. 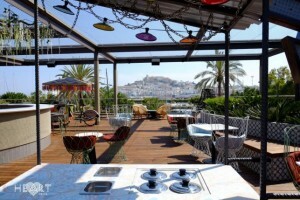 With HEART they expand their culinary universe and set ashore in Ibiza. HEART is located in the exclusive 5 * Gran Hotel in Ibiza town and opened its doors on 30 June 2015. It is an unprecedented multi-sensory concept where culture, music, art and gastronomy are combined into an amazing amusement park for adults. The magic and artistic creativity of Cirque du Soleil provide visual entertainment, the gastronomic work of the Adrià brothers (with influences from all over the world) for the culinary spectacle. 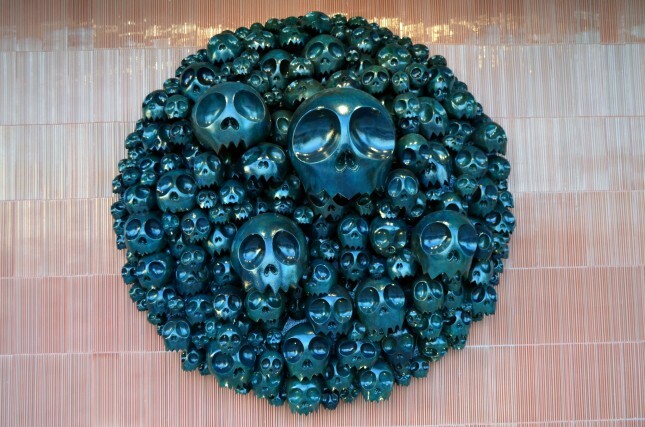 Avant-garde artists such as Takashi Murakami, Miguel Chevalier and Rafael Lozano also ensure a permanent art exhibition and top DJs and artists such as Sven Väth, George Clinton and Chic complete the picture with fantastic music. The various performances and exhibitions are changing every day, making no evening at HEART the same. 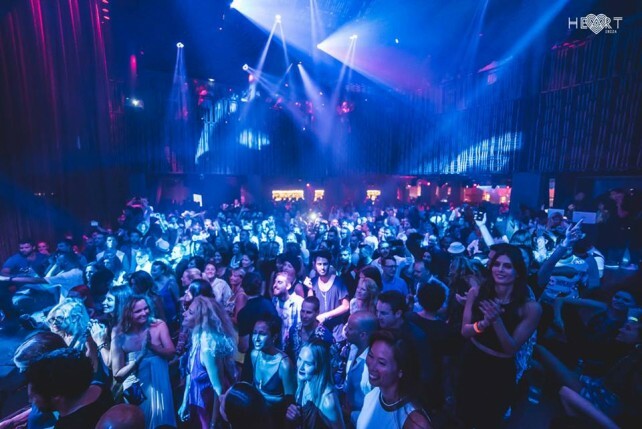 HEART Ibiza is divided into three zones: ‘Terrace’, ‘Supper’ and ‘Club’. In the three areas together no less than 80 chefs and 330 staff members are employed. In each part ‘experience’ is essential and the boundaries between gastronomy, art and music are blurred. 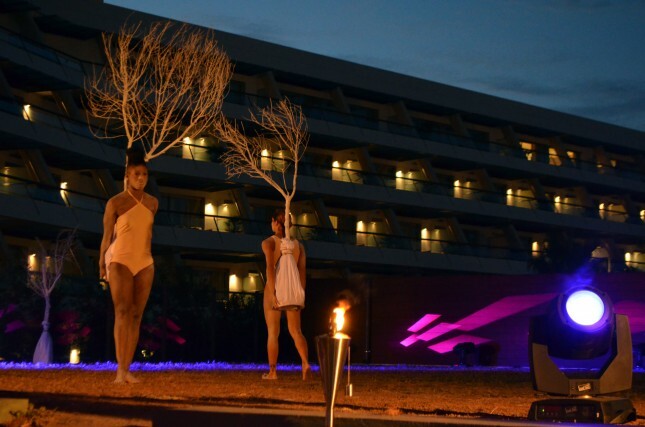 Wherever guests come they discover ‘live’ bodypaint, choreographers, beautiful art, dancers, circus-like figures, living works of art, …. The ‘Terrace’ is located on the upper floor and is interpreted as a covered street food market of approximately 1500 sqm. 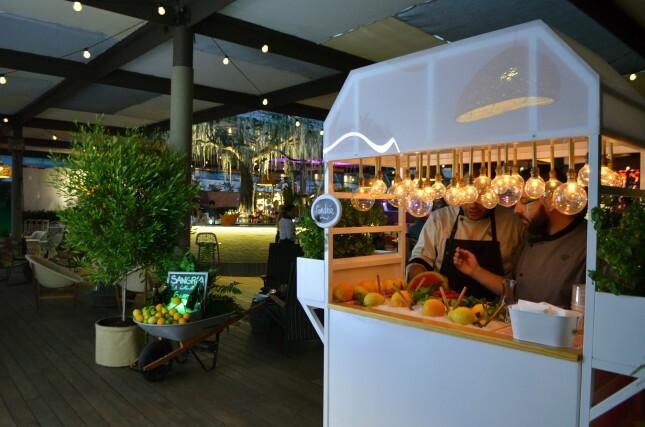 Upon arrival, guests have to buy ‘jetons’ which can be used to pay the snacks and mini-dishes at the different food stalls. The snacks are also carried around on huge plates, supporting a pleasant dynamic (and less queues). We tasted, among others, fantastic Spanish ham, Peruvian Ceviche, a Thai salad, exceptionally tasty sushi, and perhaps the best ribs we’ve ever had. On the ‘Terrace’ there is a minimum spend of € 80. 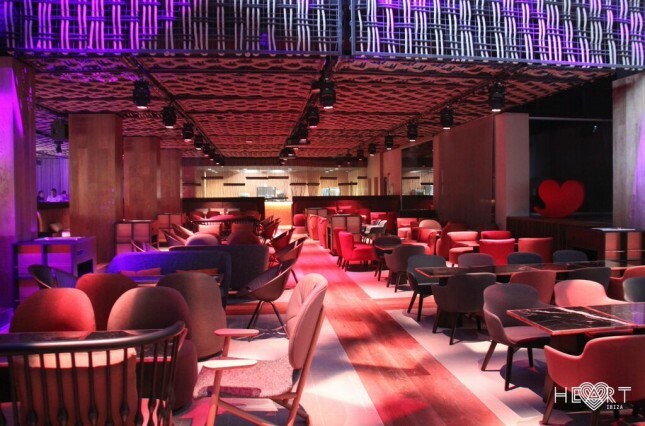 ‘Supper’ is the more gourmet part of HEART and is located on the ground floor, next to the club. Guests choose à la carte dishes to share, which are served in very creative ways. For example, one of the preparations is served in a cabinet with open sliding trays that reveal the mini-dishes. The menu is divided into different continents and the international cuisine is also the main theme here. 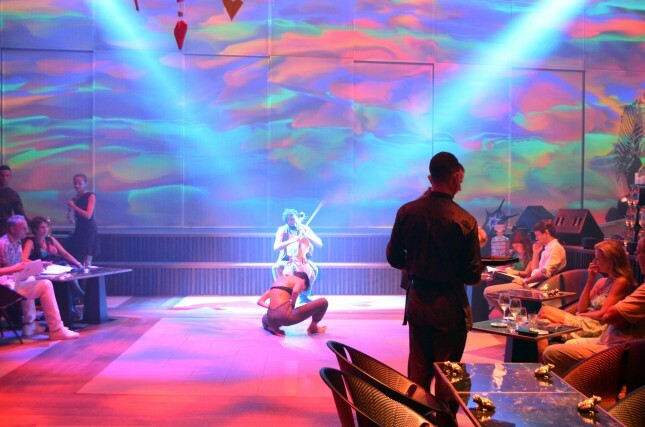 At dinner there are various performances and the music evolves from quiet down-tempo to faster beats later in the evening. For the ‘Supper experience’ there is a minimum expenditure of € 150. The ‘Club’ is situated just next to ‘Supper’ and opens already when the last guests are still enjoying their dinner. 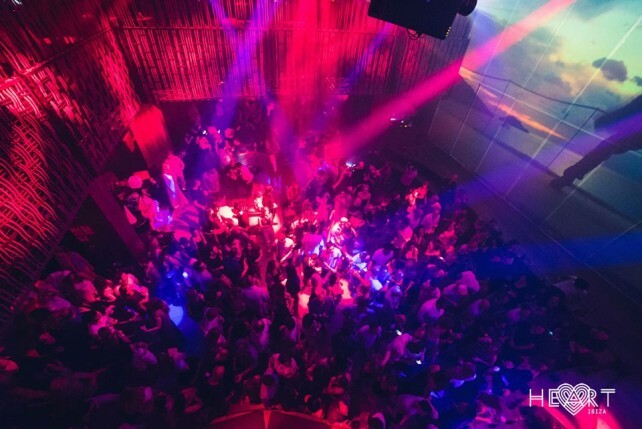 Their experience is seamlessly transformed from artistic performances to the more musical section and finally results in an intimate and exclusive nightclub. Some of the world’s biggest DJs such as Sven Väth and the Martinez Brothers have already played at HEART, and the music programming is surprising with acts like Nils Frahm, Chic Feat. Nile Rogers and Groove Armada. The entrance to the club costs € 50 but is free for visitors of ‘Terrace’ and ‘Supper’. At HEART, guests have the choice between a qualitative cocktail menu (25€/cocktail), a wine & Champaign list, and other exclusive drinks like ‘Inedit’, a beer brewed by Ferran Adrià. Experience is very important here as well and the cocktails are made with love, an eye for detail and the best quality products. Not cheap, but definitely worth a try. 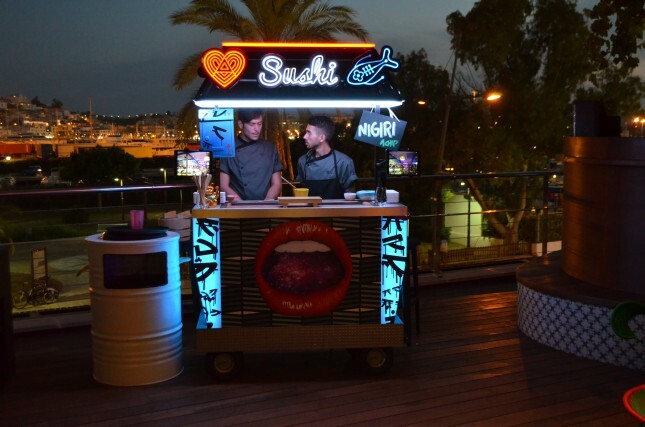 HEART Ibiza is a uncommon food concept that has to be experienced to understand. The unique atmosphere, the visual spectacle, the delicious food, the great music, … The Adrià brothers and Cirque du Soleil have managed to successfully combine multiple domains into a unique experience that will touch everyone. An extra reason to visit Ibiza!